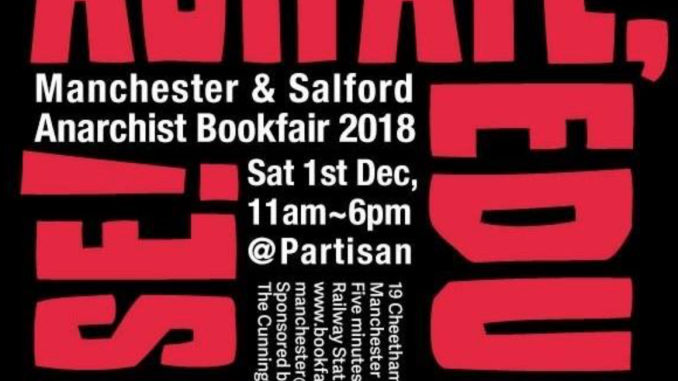 The Manchester & Salford Anarchist Bookfair 2018 will be taking place on Saturday 1 December from 11am-6pm. The venue is the same as last year: Partisan Collective, 19 Cheetham Hill Road, Manchester M4 4FY. Free admission. The venue is ideal in certain respects, such as being very close to Victoria station, but it has a serious drawback – it is completely inaccessible for disabled people. Why the organisers decided to go back to this venue, after knowing full well from last year that it is unsuitable for people with mobility issues, I do not know. Finding venues is never easy and a number of considerations have to be made, such as cost and availability. Perhaps after weighing up the options this was the most suitable venue. But it does seem a strange choice. This page of the website contains a list of stallholders. From Active Distribution and the Anarchist Federation, through the Hunt Saboteurs and Bolton Diggers to Manchester Zapitista Collective and Solidarity Federation (Manchester). Teatime Collective will serving delicious vegan food and drinks. There will also be talks/workshops throughout the day but so far there are no details. There is also, so far as I can tell, no planned afterparty.